Academia is talking about personalized and deeper learning, something I have advocated with the Skills Based Approach methodology and application for its inception in 2013. The methodology is focused entirely on an individual. The application is meant to be handled by the student or young professional to manage their learning tasks. Skills Label represents learning in any task, activity, or experience. To achieve project based learning, the labels are connected by outcomes after completing a task. Currently, there are three options: two, three, or ten outcomes (as shown in graphic). 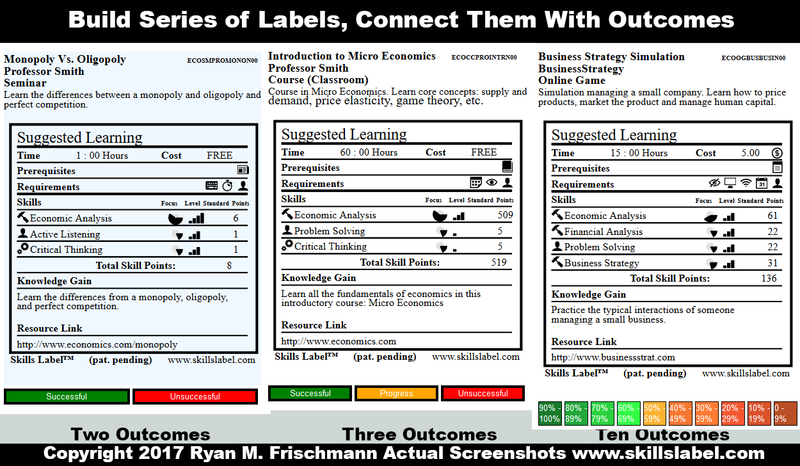 A creator of education resources, teacher, or professor chooses the number of outcomes and then assigns labels for each of them. This effectively allows a perpetual series of labels. The user (a student or professional) simply clicks on the bar representing the outcome and is taken to the next label. And the next label also has its own set of outcomes. This effectively connects the labels together. This is personal. The outcomes are determined on how the student performs in the learning experience, so next steps are tied to individual performance. This promotes project based learning (PBL) and deeper learning. One implementation of PBL is a series of tasks with conditionals, precisely what it accomplished with this new functionality. Significant data can be collected from a series of labels, and could be a source of future iterations and features. But, for now, a human (teacher, professor, etc.) controls what happens with each of the outcomes and creates their own series. This is ideal for a teacher or professor creating and assigning tasks a course, or a company moving through an onboarding process. Start creating your own series of Skills Label.